InfoSec Handlers Diary Blog - New variant of CryptoWall - Is it right to call it 4.0? 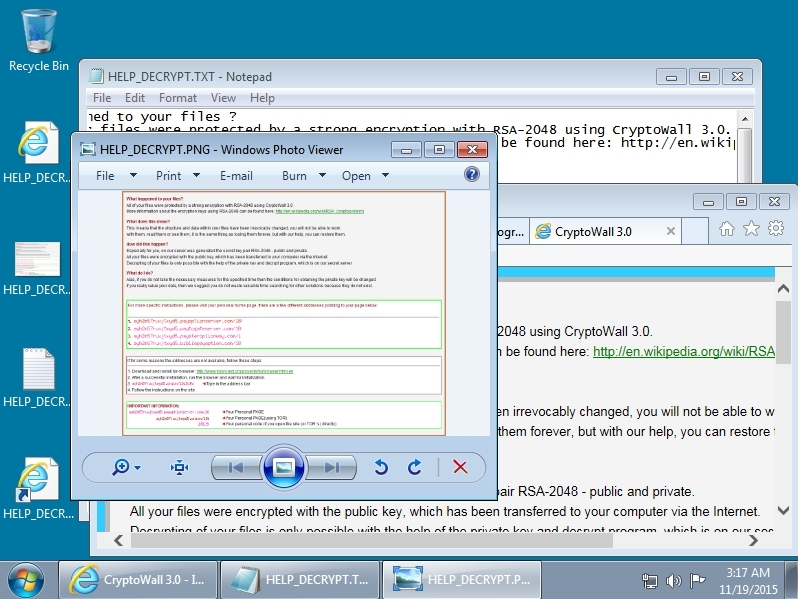 SANS ISC: InfoSec Handlers Diary Blog - New variant of CryptoWall - Is it right to call it 4.0? New variant of CryptoWall - Is it right to call it 4.0? 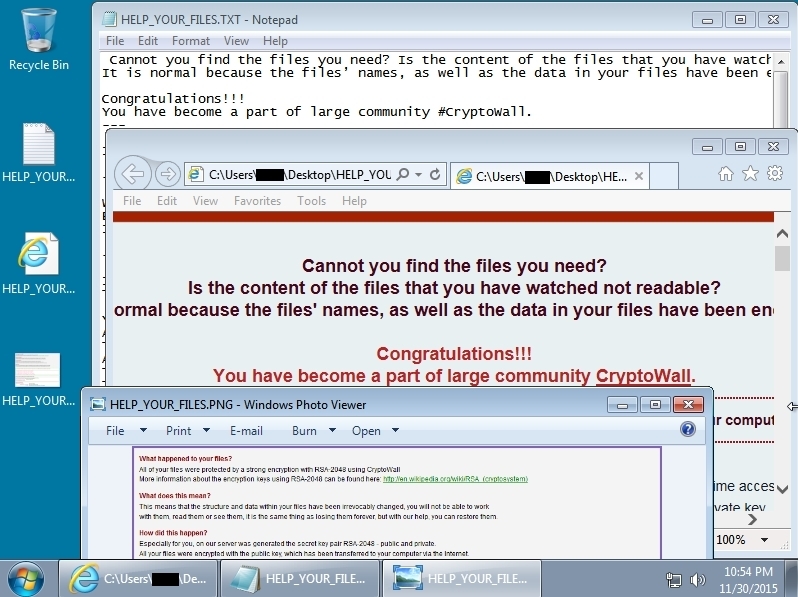 Earlier this week, I saw the most recent variant of CryptoWall as a payload delivered by the Angler exploit kit (EK) . Many people, including me, have been calling this new variant "CryptoWall 4.0." However, version 4.0 is not the most accurate term for this ransomware. So why are we calling it that? On 2015-11-03, BleepingComputer published an article about this new CryptoWall variant, calling it CryptoWall 4.0 . It had some notable changes from the previous variant. The next day on 2015-11-04, someone else pointed out this new variant didn't refer to itself as version 4.0. Instead, it appeared to be 3.0.1b034 build 0078 . However, many security sites followed BleepingComputer's lead, calling the malware "CryptoWall 4.0" [4, 5, 6, 7, 8 to name a few]. I even called it 4.0 in my previous ISC diary, back when I saw this new variant appear in Nuclear EK traffic . A few sites haven't called it 4.0, though. Instead, they have merely noted this is a new variant [10, 11]. However, the vast majority of people have reported the new CryptoWall variant as 4.0. Until now, CryptoWall has been specific in its version numbers. Since the original CryptoWall moved to version 2.0, the group behind CryptoWall has always stated the version number in the decryption instructions. We noticed this from CryptoWall to CryptoWall 2.0. We also saw it when 2.0 went to 3.0. If they haven't indicated so, the people behind CryptoWall apparently don't believe their recent changes are enough to warrant the version 4.0 moniker. Even though CryptoWall's authors are not calling it 4.0, the changes in this new variant are quite noticeable. From a network traffic standpoint, we don't see the malware check an external site for the infected host's IP address. Other changes are also notable--the notification text has changed, the names of the notification files are different, and the file names of your encrypted files are also encrypted. This is a significant change in CryptoWall. So what's the best way to let people know about the new CryptoWall? How can you get someone's attention? You can give it a new name, or perhaps a new spin on the same name. The 4.0 designation may be inaccurate from the malware authors' view; however, it's a good way for us as defenders to identify the new variant. For example, Bitdefender explained to SecurityWeek.com that it assigned the 4.0 designation to signal a new version of the CryptoWall threat . The changes from 3.0 to "4.0"
"4.0" has no more IP address check to ip-addr.es like there was in CryptoWall 3.0. 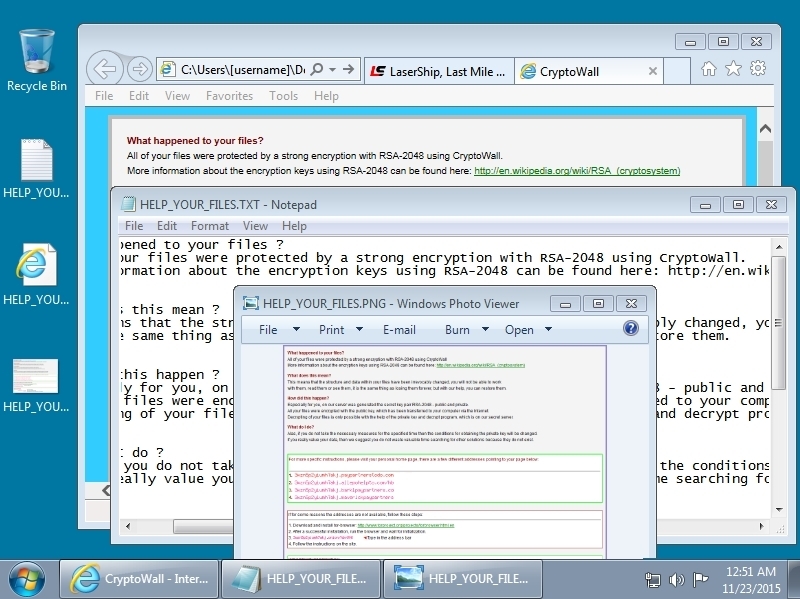 Decryption instructions in "4.0" state it's "CryptoWall" instead of "CryptoWall 3.0"
CryptoWall "4.0" also encrypts the file names of the files it encrypts. CryptoWall 3.0 doesn't change the file names. The images below illustrate some of the changes. Shown above: CryptoWall 3.0 traffic, filtered in Wireshark, with an IP address check to ip-addr.es. Shown above: CryptoWall "4.0" traffic, filtered in Wireshark, without the IP address check to ip-addr.es. Shown above: Windows desktop after a CryptoWall 3.0 infection. Shown above: Windows desktop after a CryptoWall "4.0" infection (malware from BizCN gate actor using Nuclear EK). Shown above: Windows desktop after a CryptoWall "4.0" infection (malware from another actor using Angler EK). I've discussed this CryptoWall version issue with other security professionals. Most have told me CryptoWall 4.0 is a good way to refer to this new variant, at least for now. However, I like to be precise. Calling this a new CryptoWall variant is okay. In fact, we should probably forget version numbers when referring to CryptoWall, at least for now. My most recent sample of this new variant of CryptoWall, delivered by Angler EK, can be found here.